The Guardian Angel's back is never turned to God. In truth, they really don't have 'backs' as such. The Guardian Angel always has a face turned to God and always has a face turned to you. 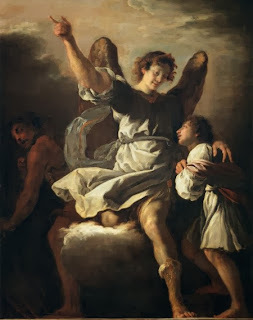 The Angel does not turn from God to face you, nor does he turn from you to face God, it is a constant communion, the God with the Angel and the Angel with You. As a result, there is a constant communication from God to your Guardian Angel for what is best for you in your path to the Father. 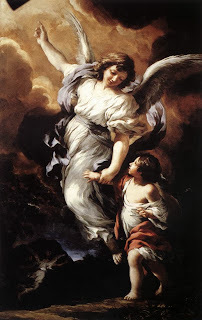 The Guardian Angel is always before the throne of God adoring God at all times, and from this constant adoration you are given strength and encouragement and benefit from this direct line to the throne of God. 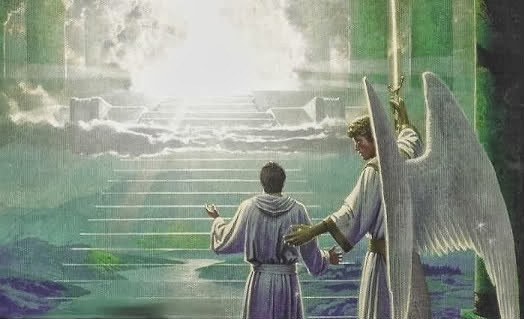 This is not a free pass into heaven though, for even though we have this grace throughout our life, no angel can by their worship subject what God has given us in our own free will. For many will face the eternal death of fire of their own free will, Guardian Angel or no. Free will is truly the only thing we possess and the thing we will be held most accountable for. It is truly our scariest possession for our free will has both grave and wonderful consequences. A Guardian Angel has three jobs, "Lead, Protect, and Defend." Lead: Our Guardian Angel constantly points to the Throne of God and the path to Heaven as the right way to go. The Angel constantly puts in the sinners path the image of the Cross of the Lord or other holy words, books, or images to prompt the sinner to choose God. If the sinner has repented and is on the path of purification then the Angel will direct the soul to what it may need most to obtain the greatest holiness it can. This can mean that little feeling to not speak when we have a great line to something someone may have said, even if what we may say may not be deemed very spiritual. Little vices of the soul are put to instruction, by many different methods. Your angel's job is to help you on your path to holiness, never forget that. Protect: Once I stopped at St. Martin de Tours to pray. It was late by the time I left. The security guard walked me to my car. He began to show me pictures of his children. I was impatient and wanted to leave, but didn't want to seem rude, so I talked with him for a while. When I left and turned on Broadway, a car going about 70 mph ran the red light on a cross street and flew past in front of me. I knew that if I had not bee delayed those few minutes I would have been in a horrible car wreck. Another time I met a man at Church, he had never been to a Catholic Church before so I gave him a little catechism and he sat with me at Holy Mass. He said some things that concerned me but expressed an interest in the faith. I said I was willing to meet him for Holy Mass at the Church in his area (Dixie Hwy) and help him learn about the Faith. The minute Holy Mass was over, I got a phone call calling me away. Any attempt that he made to communicate with me to meet for Mass after that was garbled or full of static. This happened several times. I got it, I was being protected. I prayed for the man and let it go, and have not heard from him since. This is a very important lesson, when it is obvious we are being protected, don't run headlong into what you are being protected from! Defend: Our Guardian Angel defends us, as God allows, in ways we shall never truly perceive until we are before the Throne of God. This is the Guardian Angels last job is to accompany us to the Throne of God for our own personal Judgement. With God there is no "defense" as there is in a court of law, for the Justice of God is perfect. You will have no great speeches before God in your defense, for nothing is hidden from the Great I AM, He knows your rising, setting, and the secret designs of your heart for every action and thought. Your Guardian Angel is not there to defend you against the judgement of God, but to defend you against the attacks of the devil. Yes, the demon will be there at your judgement seeking to drag you to His kingdom for all eternity. Using Your Guardian Angel Effectively. 1. Pray and ask that your Guardian Angel guide you so that God's will is fulfilled in everything that you say and do today. 2. Thank your Guardian Angel for what he does for your at every moment, even if you do not perceive it. 3. Ask your Guardian Angel to join you in prayer, (especially in front of the Blessed Sacrament!) especially if the need in the prayer is of a grave matter. 4. Remember that your Guardian Angel is not beyond doing tasks that are in the will of God at your bidding. 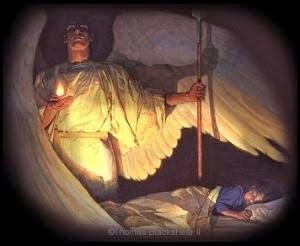 Send your Guardian Angel (briefly) to those that are in the most desperate need or are on the darkest path. Labels: Angel, Cross, Defend, Demon, Devil, God, Guardian, Guardian Angel, I AM, Judgement Seat, Lead, Protect, Satan.